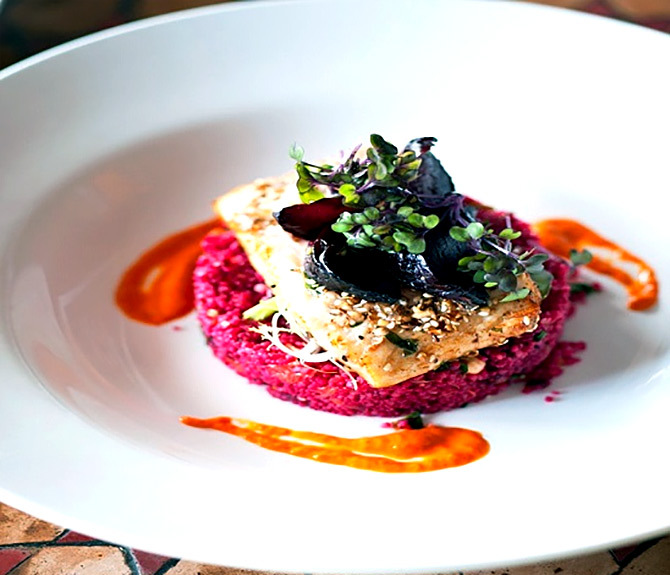 Senior Sous Chef Vijesh Modi at The Deltin, Daman shares four easy but impressive recipes. Prepare the thandai masala by dry roasting all the ingredients in a wide pan for a couple of minutes. Grind the ingredients in a mixer grinder, until you get a coarse powder. The next step is to prepare the crust for the cheesecake. Crush the cookies or digestive cookies until you get fine crumbs. Put the crumbs into a medium bowl, add butter and stir until well combined. Press the crumb mixture into small cookie cutters, spread and press flat. Make all mini crusts to make mini cheesecakes and place them in mini tart pans. If you don't have mini tart pan, you can use a regular 8 inch tart pan and set the crust at the bottom. Chill the cheesecake crust in the freezer for about 10 minutes. For cheesecake filling, using an electric whipping mixer set at medium-high speed, beat the cream cheese in a large bowl until smooth. Add condensed milk, vanilla extract and rose water in it and beat again. Add thandai masala and mix well. Pour the cream cheese filling on the crust and smooth the top with a rubber spatula. 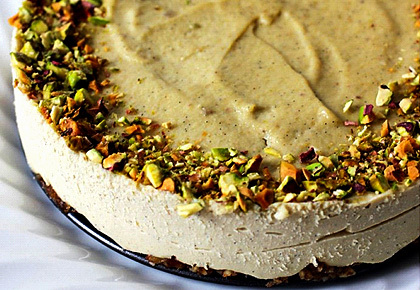 Refrigerate the thandai Cheesecake for at least 5 to 6 hours until it has set well. Combine all ingredients in a saucepan and heat just barely to a simmer over medium-high heat. Be careful not to boil the mulled wine -- you don't want to boil off the alcohol. Reduce heat to medium-low, cover, and let the wine simmer for at least 15 minutes or up to 3 hours and strain. In a heavy bottomed pan simmer the mulled wine over low heat; drop the peeled pears in the wine and cook for 15-20 minutes. Core poached pears and cut into thin slices. Combine sugar and water in a deep non-stick pan and boil. Add saffron, mix and boil for about 10 minutes or till the sugar dissolves completely and syrup gets thick. Heat sufficient ghee in a kadhai. Combine yeast and lukewarm water in a bowl, mix well. Let the yeast dissolve completely. Combine flour, cardamom powder, dissolved yeast and sugar in a bowl. Add water and mix well to make a thick batter. Set aside for 15 minutes. Add rose water to sugar syrup and mix well. Cook further till done. Dip pears slices in the batter and deep-fry in ghee till golden. Transfer pears jalebis in the sugar syrup and soak them for a minute. Combine ice cream, rose petals, rose petal jam and chopped nuts in a blender jar and blend well. Transfer the mixture into a silicon container, cover with the lid and freeze till set. Transfer some pear jalebis on a serving dish. 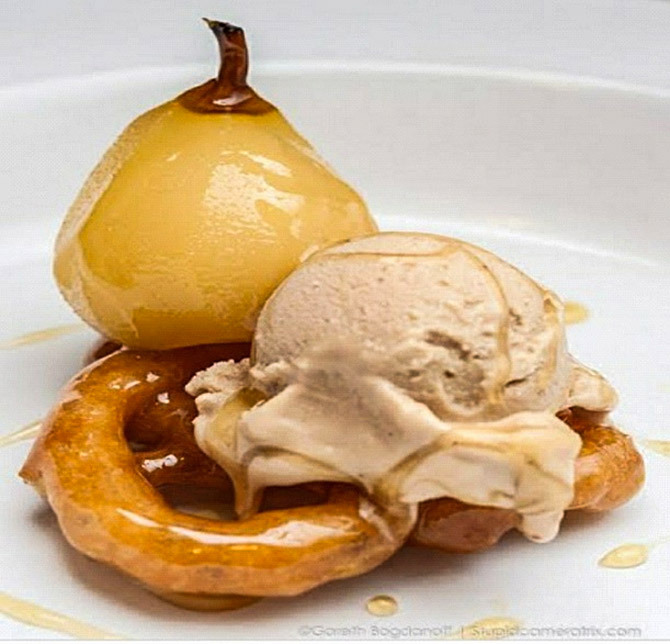 Top it with a scoop of gulab ice cream, follow with another pears jalebi. 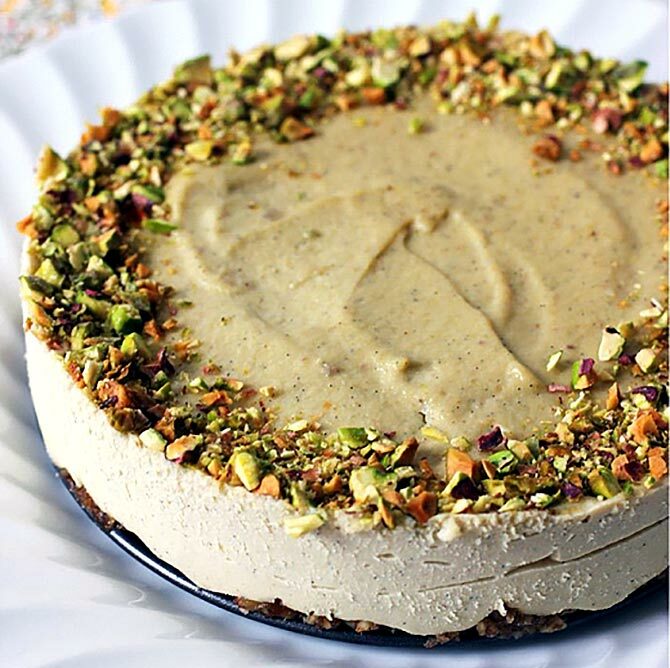 Garnish with pistachios and rose petals and serve. Mix the mashed potatoes in a bowl and add all the ingredients except oil. Mix well till combined. Take ¼ cup of the mixture and shape into a round ball. Lightly flatten it with your palm to make a tikki. Do the same with the rest of the mixture, and line them on a baking sheet or plate. Refrigerate for 15 minutes. Heat oil in a frying pan and fry the tikkis, making sure not to crowd the pan. Fry for 8-10 minutes, and then flip to fry the other side. Increase the flame so that the tikkis become crispy. Serve along with mint and tamarind chutney. Garnish with assorted micro-greens. Take spinach leaves and make a batter of gram flour and water. Add salt and pepper to the batter depending upon your taste. Add 2 tbsp chopped ajwain leaves to the mixture. Fry the mixture in oil and wait till it crisps. 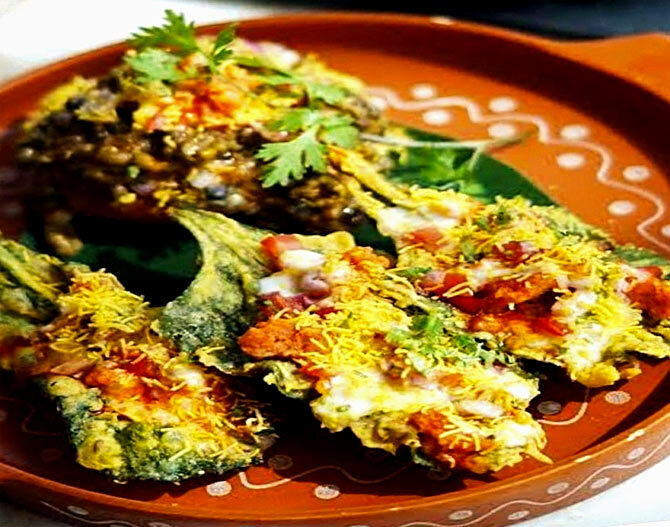 Add sweet yogurt, tamarind sauce and green mint chutney to the leaf and garnish the spinach leaf with sev.